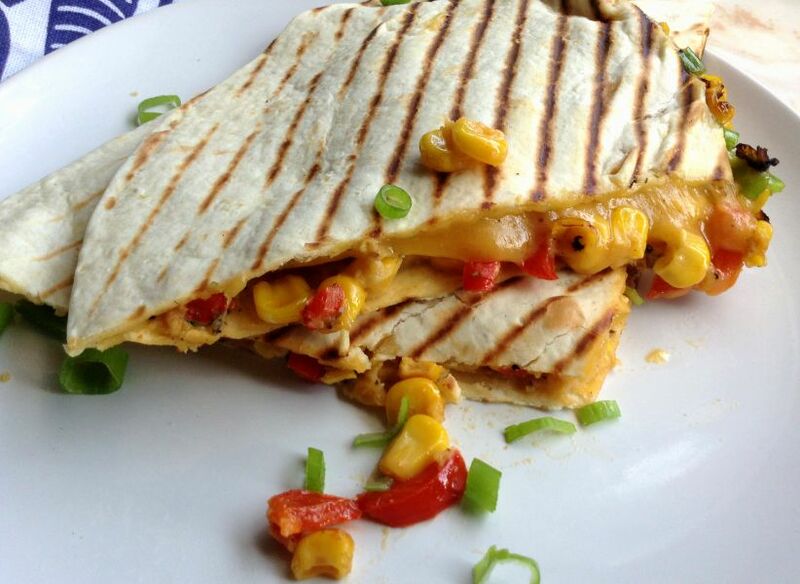 The perfect alternative to a toasted sandwich, is my new favourite, Grilled Cheese, Corn and Sweet Pepper Quesadilla. It is absolutely scrumptious and makes a great snack or lunch. 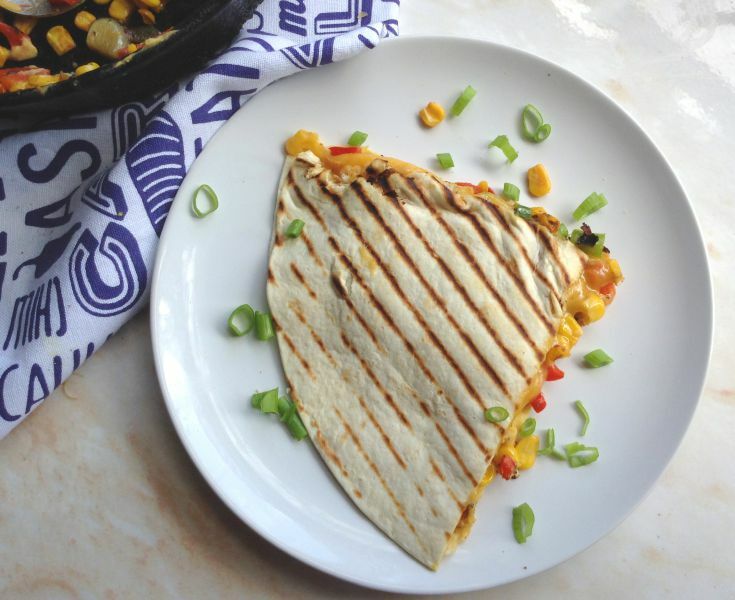 February being the month of love , I am sharing the love of my favourite food…..CHEESE of course….lots of gooey melted cheese with corn and sweet pepper sandwiched in crispy grilled tortillas. Now how absolutely yum does that sound. And a week ago last Monday, I also shared an Easy Hummus Recipe. A really delicious and healthy spread for sandwiches, pita or to be used as a dip for veggie sticks if you like. I managed to save a bit of that hummus ( and believe me, it was not easy hiding it way at the back of the fridge away from the boys just so I could use it in this recipe. ) 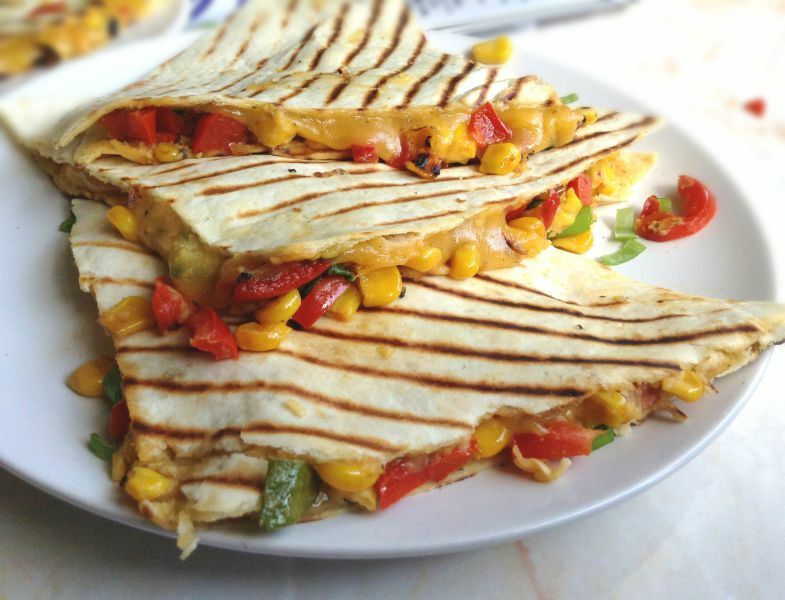 But sacrifices has to be made and I saved it just in time just enough for this Grilled Cheese, Corn and Sweet Pepper Quesadilla recipe. This filling is really simple to put together. Sweet red bell pepper is cooked with frozen or canned corn or you could use fresh corn as well. I put these two ingredients in the pan at the same time. It is cooked until the peppers are softened which takes about 8 minutes max. My obsession with spicy chilli food does not stop here or anywhere. So chilli flakes are included and to make it more crazy I add a bit of chilli powder or cayenne pepper to the pepper and corn. But chilli is totally optional so you decide on how much or little or if any to add to this filling. The hummus which I saved was carefully removed from its hiding spot in the fridge and spread onto one side of the tortilla ,topped with the cooked peppers, corn and mixed dried herbs. 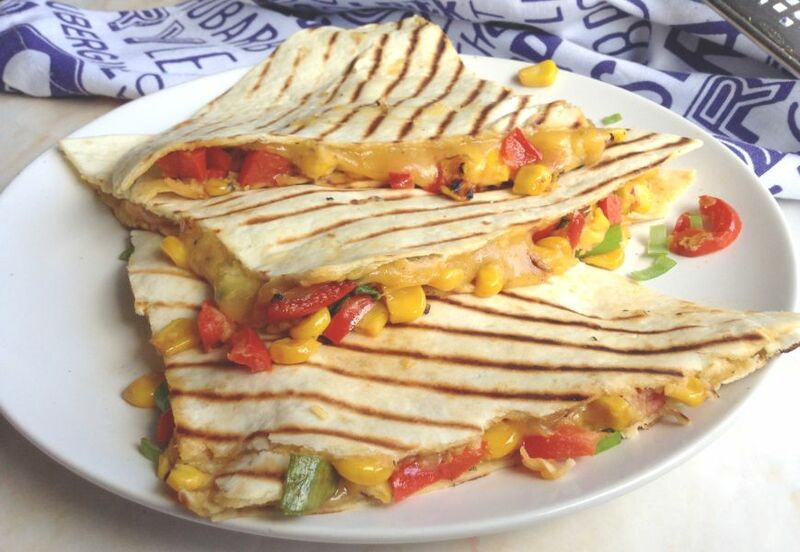 And then the crowning glory …..CHEESE, lots of grated or sliced cheese is layered on the pepper mixture. Covered with another tortilla, it is cut into 4 pieces and grilled on a hot pan. You can grill it before cutting into 4, but I seriously do not trust my flipping skills and so I cut it first before grilling…I just find it easier to handle the smaller portions. This recipe makes the filling for just 1 or 2 servings, so adjust the amount according to the size of your tortilla and the number of people you are preparing this for. So serve as a snack or lunch or how about as a delicious weekend breakfast….whichever way, I know that you are going to love it…. Have a great weekend ! Heat oil in a pan on medium heat. Add the garlic, chopped peppers, sweetcorn chilli powder, and chilli flakes, if using and cook for about 8 minutes until the pepper is softened. Spread the hummus onto one side of a tortilla and top with the cooked sweetcorn and pepper mixture. Grate the cheese over the corn and pepper mixture and add mixed dried herbs, salt and pepper to taste. Cover with the other tortilla and cut into 4 equal portions before grilling on a hot pan. You could grill it first before cutting, I just find it easier to handle in a smaller portion. Grill for ½ minute on each side, until the cheese has melted and the tortilla is crispy. Wowza!!! This looks like the perfect lunch…so many yummy flavors. And that homemade tortilla! This is such a great snack idea! Tasty and healthy too..That filling sounds so good! I am going to try these soon! This is basically my dream quesadilla. Bursting with veggies and gooey with cheese, it’s all I want for dinner tonight! This looks SO GOOD, Ashika! This is my kids’ dream meal!! That beautiful cheese….!! And sweet peppers are one of the only veggies they both like. YUM!! We’ll be making this soon! Pinned! Thank you Matt…haha got to do what you got to do! So good to have this for sudden guests…. Thank you so much ! Well this is brilliant! My son will go crazy for this! 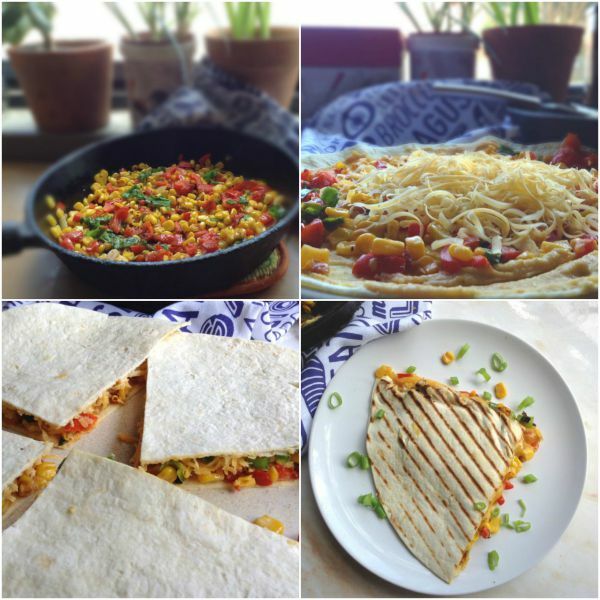 Love that you stuffed these quesadillas with veggies and added hummus! What an awesome twist! Really wish I had this for lunch right now! Ashika – this is a fantastic idea for an easy weeknight dinner! I have most of these ingredients in my fridge and freezer right now! I also am intrigued by your addition of hummus – what a great way to add extra protein! Will try this! This is perfect snack food, and I would happily snack on this all day. Anything with melted cheese is a winner in my book.